Matthew 26:36 Then Jesus came with them to a place called Gethsemane, and said to his disciples, "Sit here, while I go there and pray." Mark 14:32 They came to a place which was named Gethsemane. He said to his disciples, "Sit here, while I pray." Luke 22:39 He came out, and went, as his custom was, to the Mount of Olives. His disciples also followed him. 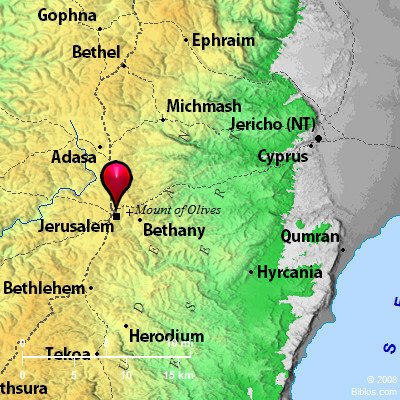 geth-sem'-a-ne (Gethsemanei (for other spellings and accents see Thayer, under the word); probably from the Aramaic gath shemanim, "oil press"): Mentioned (Matthew 26:36 Mark 14:32) as a place (chorion), margin "enclosed piece of ground," to which Jesus and the disciples retired after the last supper; in John 18:1 it is described as a "garden" (kepos), while Luke (22:40) simply says "place" (topos). From John 18:1 it is evident that it was across the Kidron, and from Luke 22:39, that it was on the Mount of Olives. Very possibly (Luke 21:37; Luke 22:39) it was a spot where Jesus habitually lodged when visiting Jerusalem. The owner-whom conjecture suggests as Mary the mother of Mark-must have given Jesus and His disciples special right of entry to the spot. Tradition, dating from the 4th century, has fixed on a place some 50 yds. East of the bridge across the Kidron as the site. In this walled-in enclosure once of greater extent, now primly laid out with garden beds, by the owners-the Franciscans-are eight old olive trees supposed to date from the time of our Lord. They are certainly old, they appeared venerable to the traveler Maundrell more than two centuries ago, but that they go back to the time claimed is impossible, for Josephus states (BJ, VI, i, 1) that Titus cut down all the trees in the neighborhood of Jerusalem at the time of the siege. Some 100 yards farther North is the "Grotto of the Agony," a cave or cistern supposed to be the spot "about a stone's cast" to which our Lord retired (Luke 22:41). The Greeks have a rival garden in the neighborhood, and a little higher up the hill is a large Russian church. The traditional site may be somewhere near the correct one, though one would think too near the public road for retirement, but the contours of the hill slopes must have so much changed their forms in the troubled times of the first and second centuries, and the loose stone walls of such enclosures are of so temporary a character, that it is impossible that the site is exact. Sentiment, repelled by the artificiality of the modern garden, tempts the visitor to look for a more suitable and less artificial spot farther up the valley. There is today a secluded olive grove with a ruined modern olive press amid the trees a half-mile or so farther up the Kidron Valley, which must far more resemble the original Gethsemane than the orthodox site. GETHSEM'ANE, "oil press", according to tradition it is e. of the Kidron about 100 yds. and at the foot of Mt. of Olives. This tradition can be traced back to about 400 Asher Dan A wall was built around it in 1847.